You’re looking for new camping recipes and camping menu ideas for your next campout, right? I‘m here to share some of our favorite camping recipes and menu ideas with you. These 26 recipes are healthy, but still family-friendly. They will help make your next campout a HUGE success! But before I share them, there are a few things you should know about camp cooking…. 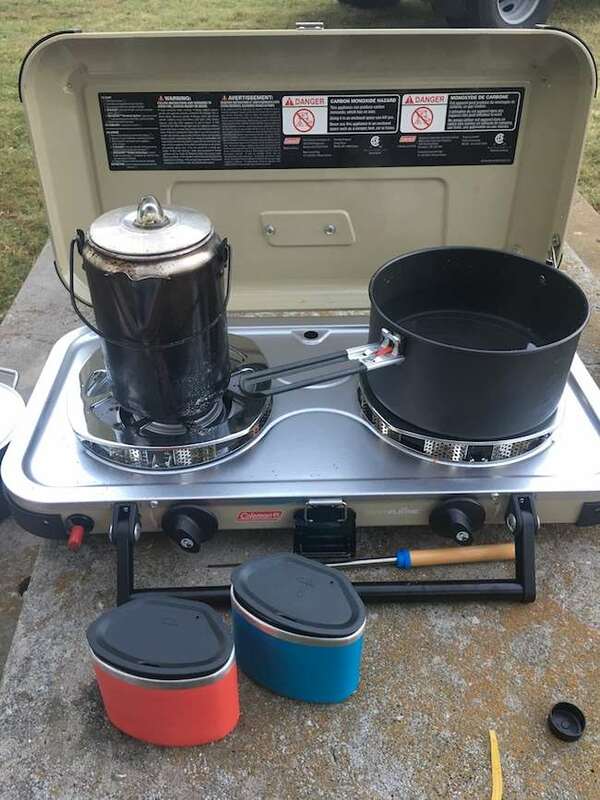 When it comes to cooking meals while camping, it pays to have a plan! Once you get to your campsite, there is no running to the grocery for something you forget. Gathering a few camping menu ideas and creating a camping meal planner is SO important. It gives you a plan for what to cook and ensures that you bring EVERYTHING you need with you. Take a look at this camping meal plan or …. Want a complete weekend camping meal plan with recipes & printable shopping list? Click HERE & make your next camping trip deliciously fun and easy…..
Disclosure: This blog contains affiliate links. They help pay for the coffee that keeps us turning out adventures week after week. I’ll only recommend and share products that I use and love myself. Thanks!! Many of your favorite home recipes are perfect for camping! Really! It is so true. Grilled foods are perfect for camping when you have an iron grate or barbecue grill on site. Pre-made sides and snacks that travel well are perfect for the outdoors too. Thanks so much for including my foil packets in this amazing round-up of yumminess for camping! This is awesome. This will come in really handy! Thanks! Thanks for letting me include it Debi. I meant to get this out before Labor Day. I'm happy to hear you like the other recipes too. Thanks for including my banana s'mores! I shared this great collection on my FB page! Thanks Nicole. I tried your grilled bananas on our last RV trip and they were great. The Girl Scout version is easier just cut a slice out of the peel throw in a few kisses and close it up. All you have to do is put that on the grate or right on the coals. I'll have to try it that way. Thanks for the tip! This is a great collection, Nicky! Pinning. Thanks so much for including my paninis on the grill, Nicky! I appreciate it! Looks like there are some great recipe ideas here! These are great ideas for camping! Thank you for sharing! Thank you for sharing these recipes. I have pinned a few of the recipes to my Pinterest page to try on future camping trips. What a great idea for a round-up. Thank you so much for including my grilled pepper steak. I can't wait to try some of these on our next family camping trip. Thank you for sharing. Have a great camping trip! Where are you headed? Camping and RVing is a great outdoor adventure. You get back to nature, cook out, and have fun. When it comes to camping food, there is no running to the grocery store or picking up something in a drive thru. Meal planning is important to ensure you have everything you need. You have hit the nail on the head. Planning is everything when camping. Yes. Have a plan--and 50 yards of aluminum foil! Sooo true. I have been trying to use my cast iron more, but there is no substitute for tin foil while camping. These are awesome thoughts for camping. Much obliged to you for sharing!